Like everyone else these days, I’m in a million Facebook groups. I can’t even remember which one I was in where I saw this but I remember someone posting something TOTALLY UNRELATED to beauty but the selfie was a picture of a woman with fantastic makeup and skin. So much so that someone asked her what her beauty regime was. One of the products she mentioned using was Garnier’s Skin Renew Miracle Perfector BB Cream ($8.99, Target.com). I was so impressed with her flawless looking skin that I went ahead and ordered some the next day. It came… and people, this stuff is THE BOMB. I have really been having a hard time with dealing with wrinkles and my skin tone lately and I’ve been trying a lot of different products that I haven’t been wholly satisfied with but this BB Cream is just awesome. It’s not a cure for sure and I don’t think it’s working as a long-term product but it’s a FABULOUS cover-up on a daily basis before you apply your other makeup. It really perfects an even skin tone and fills in all the wrinkles you don’t want to be showing. Fantastic as a moisturizer too. Trust me and check it out. I got light-medium but there’s also a medium-deep option for darker complexions. I have been using thie BB cream for about a year now.. . and like you, I love it as well, for all the reasons you mention in your article. 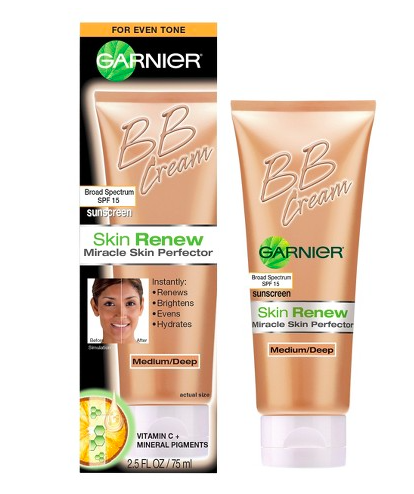 I have tried two other brands of BB cream and they did not compare to Garnier’s. I have also received compliments on my skin(and I never did before using this cream). Love also that it goes on so easily and smoothly. An excellent product, indeed!